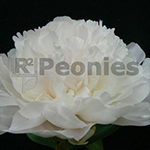 Baroness Schroeder is a very strong Peony with dark foliage and full double white flowers. This very old variety is still important in tuber and cut flower business. The fragrant flowers of Baroness Schroeder bloom in the late midseason. This peony is very tall and needs some staking. To order Peonies, contact one of us for further information.